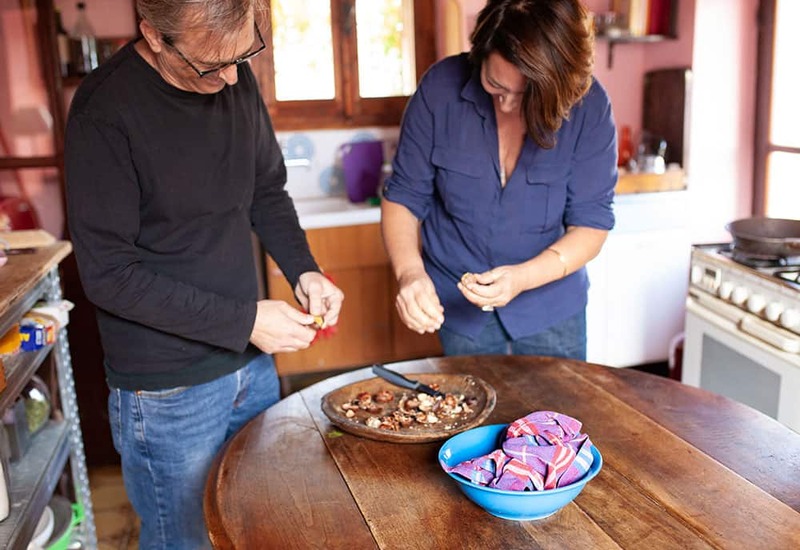 While Nazim was in Istanbul with his Mom I went with my friend Tosca and her husband Angelo to our country house in Val Tidone for a fresh air weekend. I love to spend time there in every season since each one has its own beauty but fall is the most colorful one. 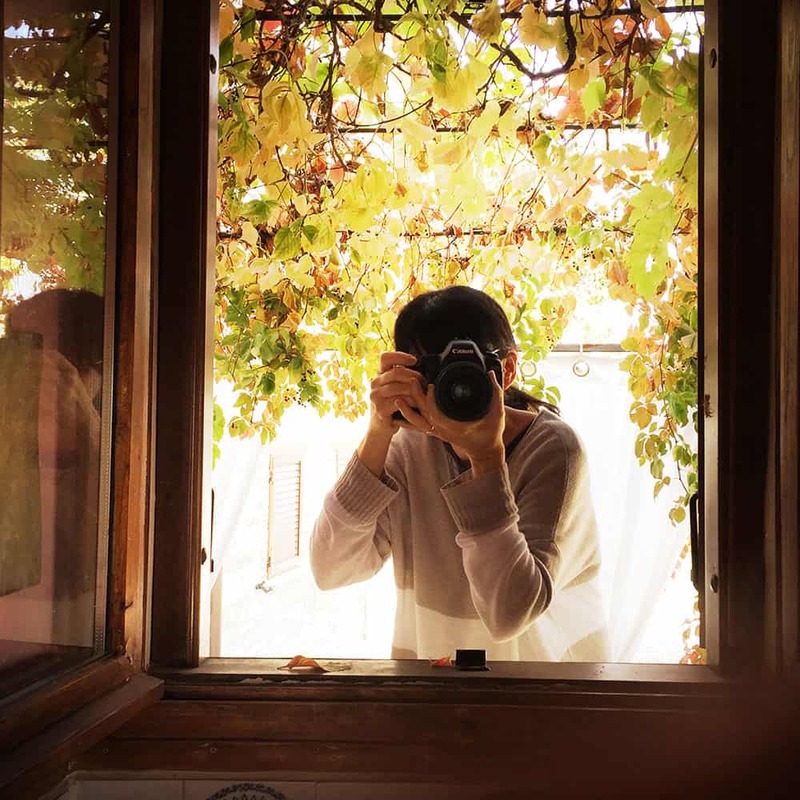 All the trees and the vineyards turn yellow and red, the sun shines with crispy light and all around you watch nature’s last exploit before Winter. 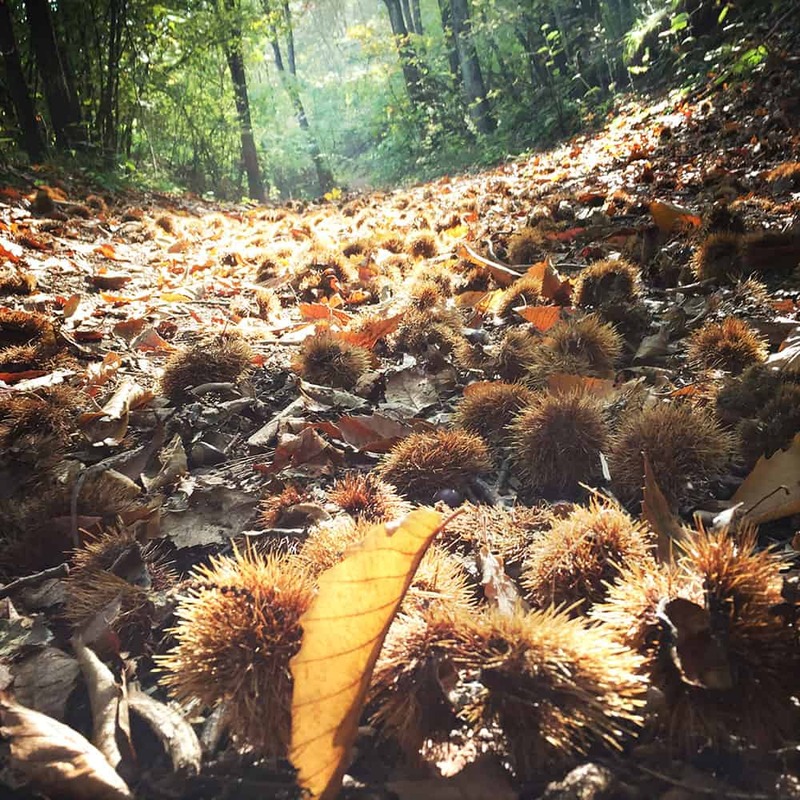 Our house leans just beside a vast wood, wild and thick, full of chestnut trees and in these days thousands of brown and bright green urchins drop at your feet when you walk on its narrow paths. 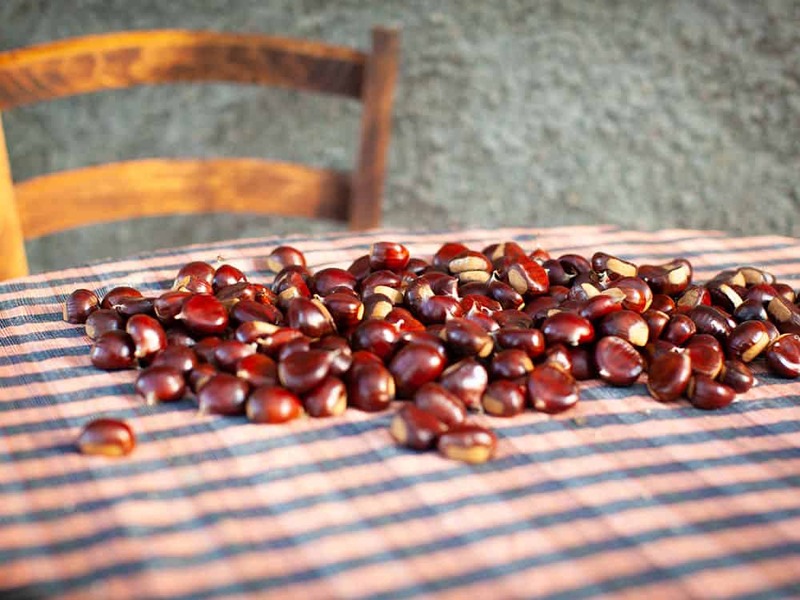 Picking chestnuts is a satisfying activity that in my case brings back ancestral memories. It definitely has the power to tickle my reptilian brain and I behave as my life depended on a good harvest. All of a sudden I forget time and companions, purpose and calories counting and here I get transformed into Lucy, the Australopithecus, the small erected bipedal that dates back to about 3.2 million years ago. I jump from a spot to another, searching for the tree that generously drops the biggest fruit, I rummage among the dead leaves like a truffle dog, I fill my jeans pockets, I create a makeshift bag with the sleeves of my sweater, I scratch myself with the dry branches, I stumble into the slippery roots and then regularly I get lost in the thick of the woods. 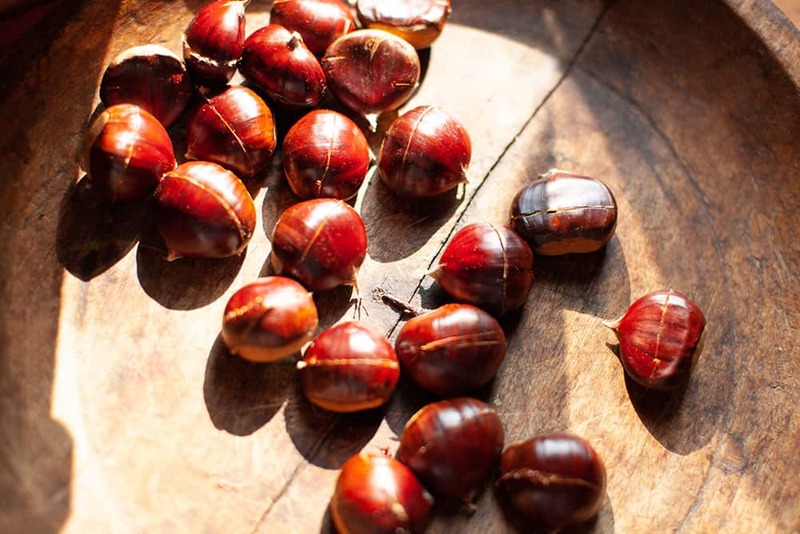 When I finally get home I immediately search and get rid of the wormy chestnuts then I voluptuously pass the hands between the slightly moist, fresh fruits, enjoying their perfect color and shape. Most of the time I obviously pick much more than I can eat and I hand out part of my treasure to those whom I consider deserving such honor. The chestnut trees are majestic, wild and shady: walking among them makes you lose the sense of time and orientation, exactly what I need to escape from the chaotic order of the city we live in. 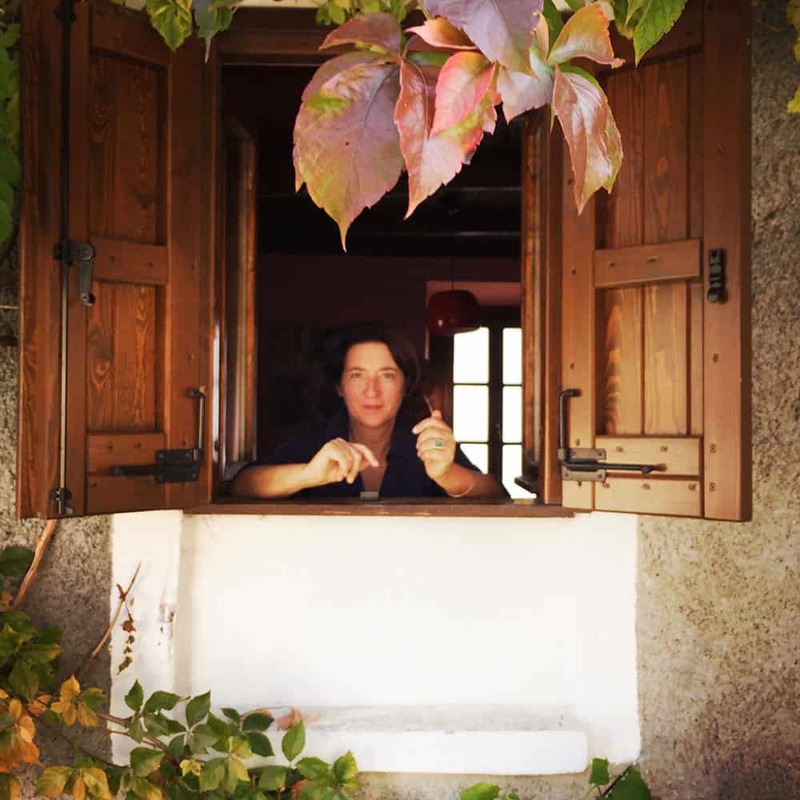 My friend Tosca who lives in Austin, Texas is a great photographer and is, by the way, the person that shot the beautiful pictures that illustrate my cookbook Eating Hearts. 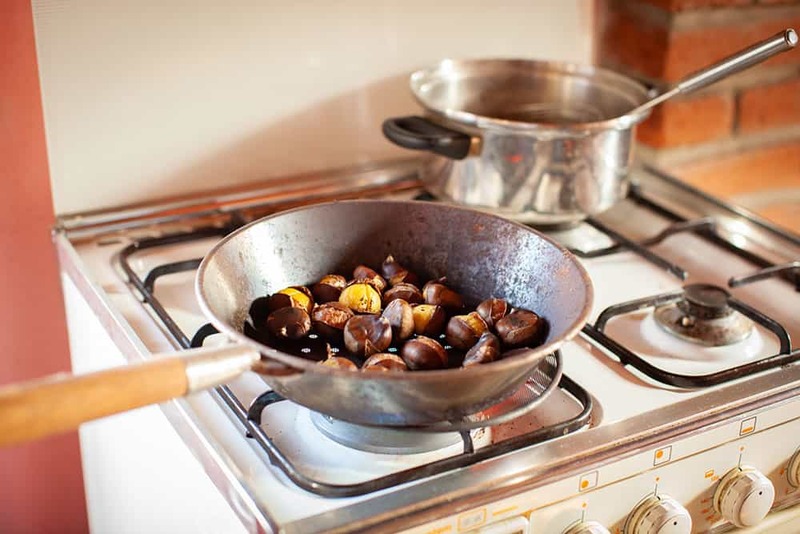 I took advantage of her visit to squeeze her a bit more since I wanted to share with you the perfect method to prepare roasted chestnuts. This is a very quick and effective process that will save you a lot of time and will guarantee a perfect result ….I love it! 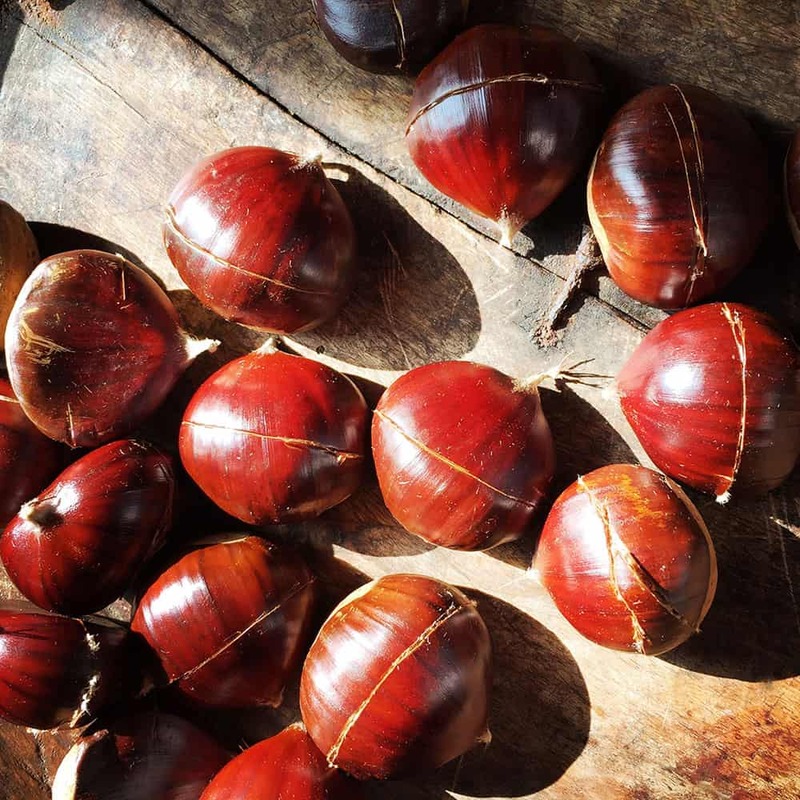 Cut the chestnuts on their belly (not on the flat side but on the curvy one) making sure you are splitting both the outside and the thin skin but not the pulp. 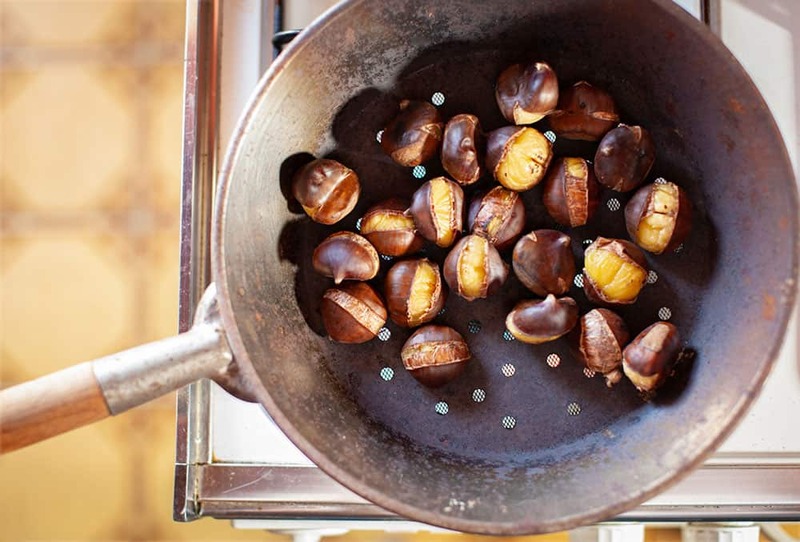 Boil them in plain boiling water for about two minutes, rinse them and quickly put them right in your perforated roasting chestnuts pan. 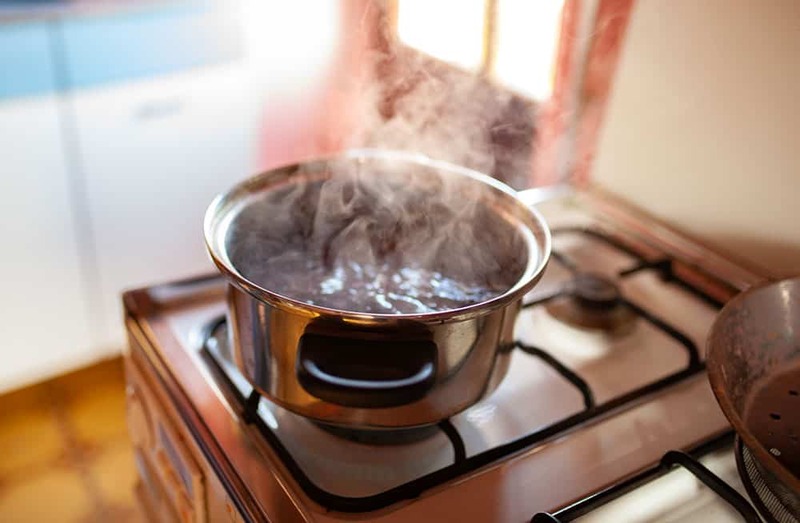 Make sure you put under the pan one of those round metal nets to diffuse the fire. 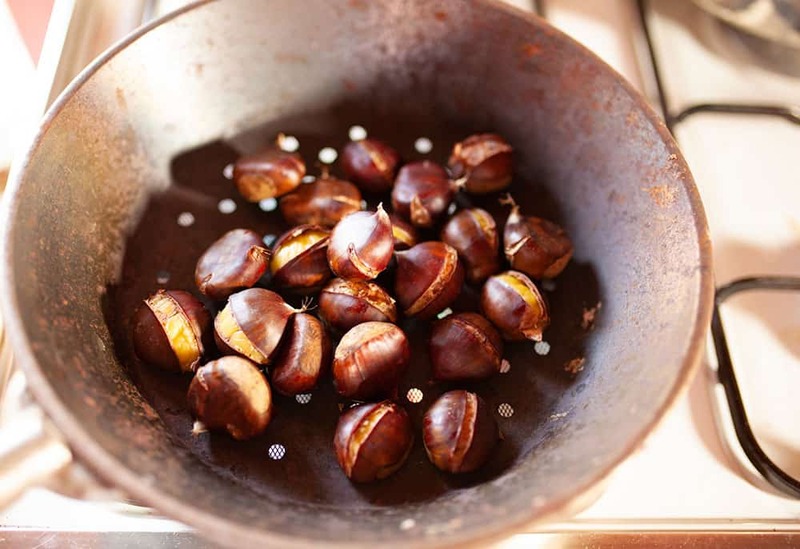 Keep on turning the chestnuts for a few minutes and you will see them opening along the cut, showing their yellow, tasty belly. 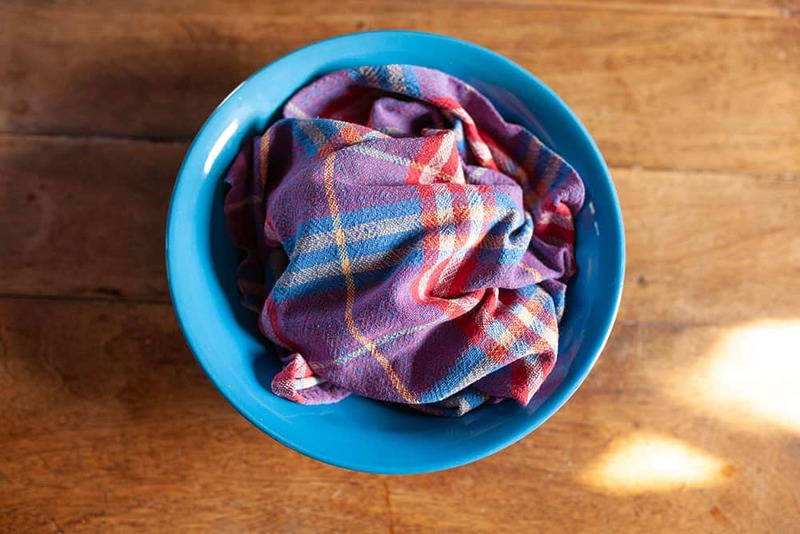 When the brown skin turns dark brown take them off the fire, put them in a bowl and cover them with a cloth to keep both the temperature and the humidity while eating.